Palatial looking villas in Fethiye Turkey for sale with a hint of Mediterranean style architecture set on a large plot with matching swimming pool and landscaped gardens. This villa is finished to a very high standard and specification and will provide its owner with a magnificent family holiday home or for permanent residency. The villa has a huge open plan ground level with fully fitted kitchen, large lounge area and separate dining area. There is a large double staircase leading to the upper floor and two sets of patio windows leading you out onto the patio and terraces. The bedrooms from the upper level have large balconies overlooking the swimming pool. Each bedroom is fully fitted out with en-suite facilities and dressing area . This villa is part of our Custom Built Range and is built to order. The villa can include any ideas or specification you desire. The villa is complemented with a designer swimming pool and gardens. 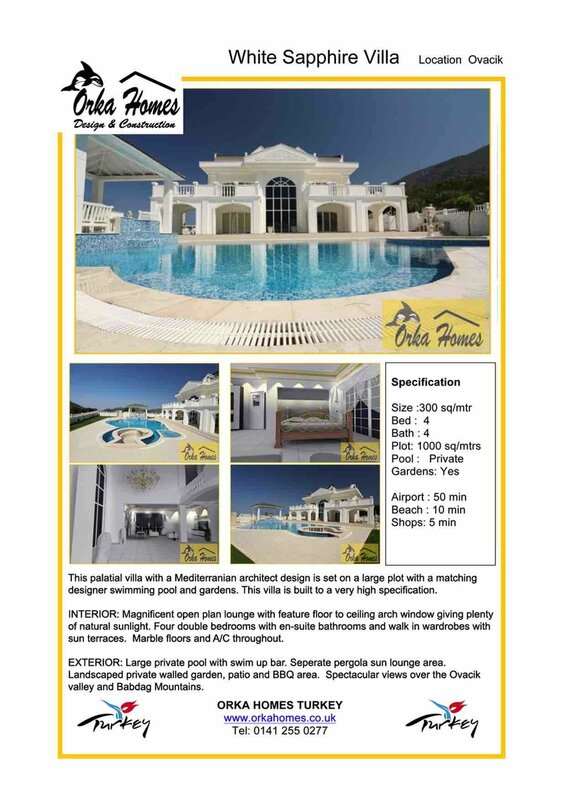 Prices for this style of villas in Fethiye Turkey for Sale start at £350,000 up to whatever your budget may be.